With that kind of background, it seemed inevitable that Rutledge would someday end up working with horses—and today, she does just that. As the founder and executive director of Triangle Therapeutic Riding, and co-owner with her husband of Stony Run Fields, the ranch that TTR calls home, Rutledge is in her glory. “My family moved three times when I was growing up,” Rutledge said. 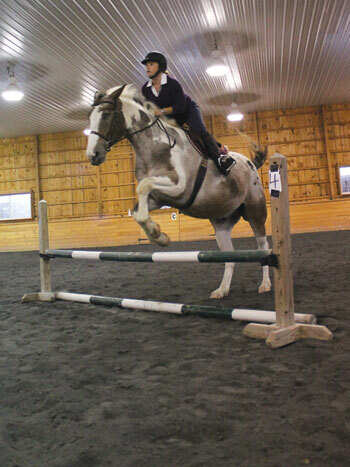 Rachel Sensenig, riding Serena, is building up her core and leg strength and improving her balance. By navigating around photos, objects of interest, and letters around the arena, Sensenig is motivated to look forward instead of down so she can learn to steer her horse. Johnathan Gehr rides Takoda. Gehr, who has autism, has learned many horsemanship skills and life skills over his eight years of riding, including self-regulation skills to cope when he gets upset or inpatient, like pausing and taking a breath. Between the ages of 5 and 8, Rutledge lived near a farm in New York that had ponies. Then the family moved to Puerto Rico, where she lived until she was 14. Six years later, the family moved to Pennsylvania, bringing their horse with them, to a house with an eight-stall barn. They took on some boarders and taught basic lessons to the neighborhood kids. That desire would eventually lead her to a degree from Penn State in therapeutic recreation and then to pass a national test to become a Certified Therapeutic Recreation Specialist (CRTS). This happily married mother of two worked as a CTRS for several years but found herself back at Thorncroft, volunteering and taking their therapeutic instructor course and obtaining her PATH International Certification. Unfortunately, however, in time she had to resign. “I loved working there, but my son had some health issues so I needed to find something where I could take a lot of time off,” she said. 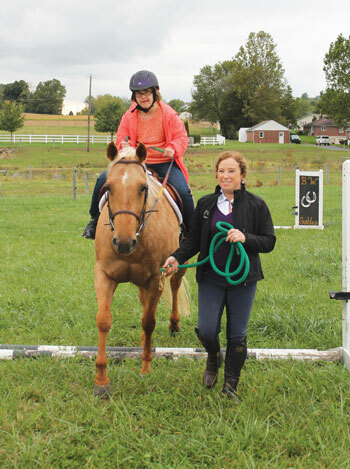 Using the knowledge and experience she had gained so far, and relying on her church and her Thorncroft family for support, Rutledge decided it was the right time to start her own small therapeutic riding program. Kendon Garman rides Buster as he takes an English riding lesson with trainer Larissa Ott. 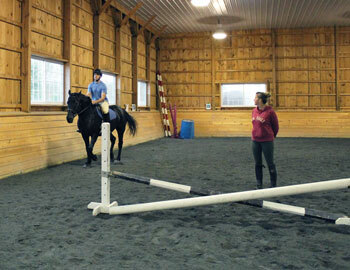 Garman is on the equestrian team at the Penn State Berks County campus. 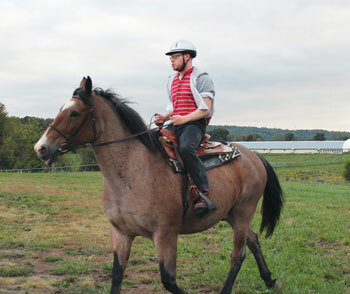 Rutledge rides Aspen, a paint Appaloosa draft cross horse. A young but very gentle horse, Aspen’s demeanor makes him not only an excellent therapy horse, but also a good jumping horse. Aspen is the official veterans program horse for Triangle Therapeutic Riding; he was purchased and donated by the Reinholds VFW. The relationship between a rider and her horse is a special one. She explained that when the riders feel good about what’s happening, the horse typically does as well, unless he’s in pain, and then it’s the human’s job to pick up on nonverbal cues from the horse. 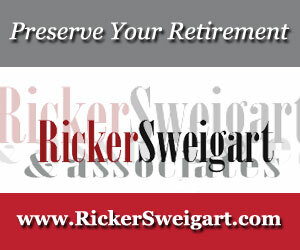 “The same goes for our clients and horses. When they are having a bad day and come to the barn where the horse is completely attentive to them, they light up when they realize that the horse is connecting with them,” Rutledge said. Her days are busy, starting early in the morning as she checks on the well-being of the horses and the barn and training staff. 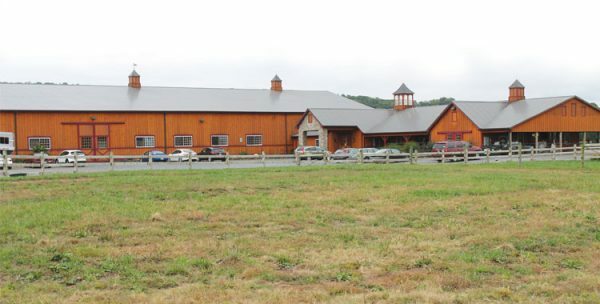 “Managing Stony Run Fields is done with help from my husband, both my kids, and the attentive barn staff,” Rutledge said. Arena and pasture schedules have to be organized, daily cleaning must be done, health and medical issues facing the horses must be addressed, and endless paperwork has to be handled. But it’s all in a day’s work for Rutledge. Again, schedules must be coordinated, equipment must be checked, lessons must be planned—and sometimes, Rutledge even gives presentations to potential sponsors, schools, or local charities. But she and her family don’t do it alone. Her co-workers have told Rutledge that she should write a book about all of the amazing success stories that have come out of the hard work and dedication of the TTR staff and their horses. “The latest is a little girl with many sensory issues, nonverbal or no expressive language other than body language, extreme fear issues, moderate intellectual challenges, and a very complicated diagnosis,” Rutledge said. 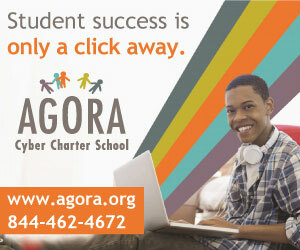 All students who attend the TTR program are treated with great respect, something that is very important to Rutledge. One of the things that TTR does as a good-will project is to have “visit days” where they schedule a special-interest group to come and check out the program. Some of those have included adults from a group home, learning support classes from local school districts, kids from the inner city, and even groups of veterans. It’s just another way of giving back to the community. Her journey to where she is now hasn’t been an easy one, but Rutledge is especially grateful to her husband for “pushing me to work harder and for all of his help,” she said.